Invite the Scripture Lady to present her elementary Bible song program “The Wordless Book” – a fun Scripture-filled musical presentation that shares the Gospel of Jesus Christ. If you’ve never heard of the Wordless Book – you’re in for a big treat- literally! The Scripture Lady will share the Gospel by giving significant meaning to each of the 5 great Wordless Book colors – yellow, black, red, white and green. Each of the Gospel points is also taught by the creative presentation of a certain kind of candy. For example, Tootsie Rolls will remind your children of the sin in their lives. A Hundred Grand Bar will remind them that Jesus “paid the price for their sin,” and a York Peppermint Patty will represent their lives as Christians and God’s great grace! Your kids will be challenged to invite Jesus into their lives after they have sung their way through great key Gospel verses. Kathy then proceeds to talk about what each color means. She explains that yellow is to remind us of Heaven. The Bible says that in Heaven there is going to be one street made out of pure gold. But as exciting as that may be to see one day, that cannot compare with the fact that Heaven is where God lives and it is God’s desire that everyone would choose to live in Heaven with Him forever and ever. But Heaven has rules. And one of the biggest rules about Heaven is that absolutely nothing bad or specifically sinful can ever enter into Heaven. This brings us to the black or dark color. Once the audience realizes that everyone is a sinner, Kathy goes to the red color. The red color is to remind us of the blood that Jesus shed on the cross to cleanse us from all our sin. The children are then introduced to the Bible verse song 1 Corinthians 15:3-4. 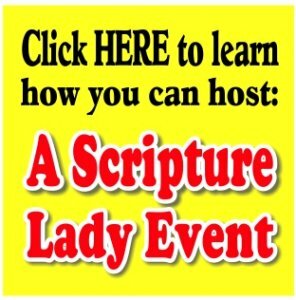 The Scripture Lady then shares an engaging gospel magic trick that describes how the blood of Jesus covers over all our sin. Next, comes the white or clean color. Kathy begins to share a little bit about how she chose to ask Jesus to forgive her sin when she was 13 and asked Jesus to be her Savior. She then pulls out a Peppermint Patty to help illustrate her life as a Christian. The outside of the patty is a dark chocolate, which can remind us of our sin, but the inside is a clean white mint, which can remind us of how God sees our hearts once we ask Jesus into our lives. Finally, the Scripture Lady returns full circle back to the yellow color and pulls out a Mister Goodbar candy bar. This prop is used to teach the children that many people think they can get to Heaven just by being really, really good. But this is not true. The only way anyone can be truly good without sin is by believing on the Lord Jesus Christ as their Savior. Kathy ends the program by reminding the children that if they choose to ask Jesus to forgive them of their sin and to accept Him as their Savior, then one day they will get to live in Heaven with Him forever and ever. Therefore it is fitting to end the program with a lively version of John 3:16 pointing to God’s gift of eternal life. It is a clear presentation of the Gospel at an elementary level. her Bible songs for kids at your church or school? * A clear and accurate presentation of the Gospel for kids. Book your Bible Song Program today! It could really change your life today!